Johnny Barnes, a beloved Bermuda icon and national treasure, passed away today at the age of 93. Mr. Barnes is best known for his decades of standing at the Crow Lane Roundabout, originally from 3:40am to 10am, and greeting motorists on their way into Hamilton on Mondays through Fridays with a hearty “I love you” or “Good Morning” with a big friendly wave or two hands pressed to his mouth then outward to signify a kiss. He didn’t need any money to be such a goodwill ambassador to the people, his payment was the smiles, waves and kind words directed back at him. Such was his unfailing spirit to help spread the love, that a bench, then a railing was erected to help him say “I love you” to all who passed by. Finally, last December he had to give up his familiar spot when his health wouldn’t allow him to take up his post. Johnny was immortalized in a Desmond Fountain statue on East Broadway in which his arms are outstretched greeting passersby. Mr. Fountain said he came up with the idea for the statue because he was afraid Johnny “wouldn’t be given any recognition or appreciation”. He has also been the subject of two movies; The short documentary by New York-based filmmaker Rosanne Ma entitled Welcoming Arms and Matt Morris’ short Mr. Happy Man. He started his call of shouting out to people “I love you” when he was eating his lunch on a wall as a railway worker. 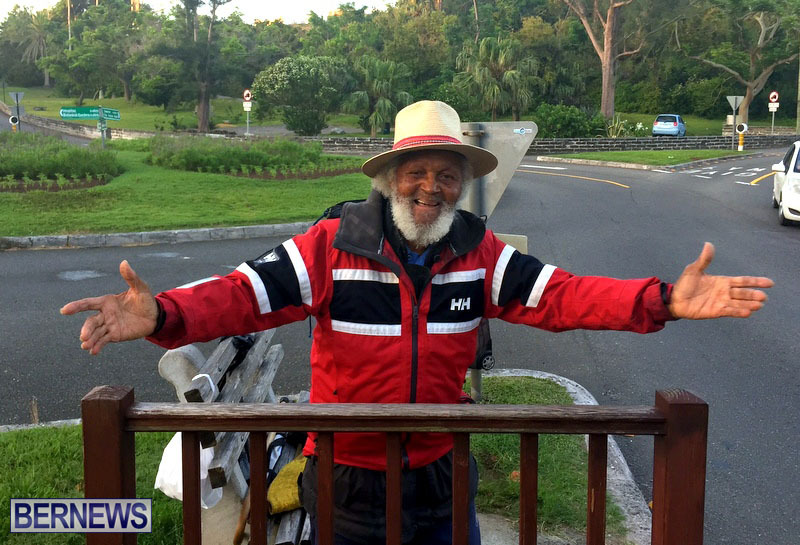 After the Bermuda Railway closed, Mr. Barnes took up greeting passengers as a bus driver. Update 2.05pm: Premier Michael Dunkley has extended condolences following the passing of Johnny Barnes. Premier Dunkley said, “‎I join with all Bermuda in expressing our sadness at the passing of Mr. Johnny Barnes. “He was a remarkable, original man whose life gave life to the love we all have in our hearts, and who, from his round-a-bout perch each morning, expressed that love to all who passed by — friend, acquaintance, stranger, it did not matter because Johnny Barnes embraced the human race. “Johnny Barnes was the quintessential ambassador for Bermuda. He had an international following which had countless visitors to our Island making it a priority to meet an greet Johnny during their stay. “Not too long ago, I had the special privilege of spending a little time with Johnny and his family and during our conversation I was reminded of his love and appreciation for Bermuda and her people. “He was a man of resounding faith, love and compassion who always tried to see the goodness and positive in life. He was truly and inspirational figure who will be greatly missed. 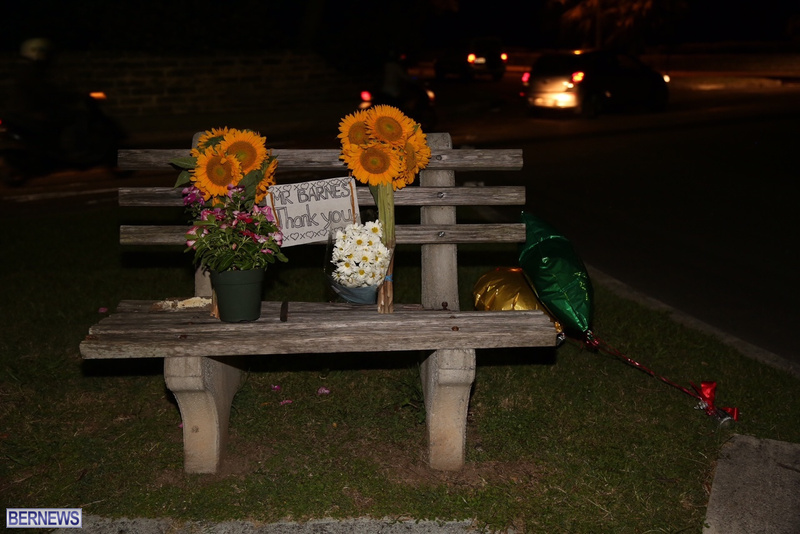 Update 9.34pm: Flowers and a sign saying “Mr Barnes, Thank You” can be seen at the round-a-bout. Even through the tears I can’t help but still smile .. That’s what he would want. I’m sure he has a radiant smile! Good Bye Johnny you were a great man and will be missed . While living in Bermuda, I would see Johnny greet our bus daily. He made everyone smile. It started every day a little better. Thank you Mr. Barnes, for brightening many of my mornings, we’ll miss you, Rest Well, your work here is done. Johnny, you may be gone, but you remain as part of Bermuda in our minds and in our hearts. Thank you for the great you did, the spirit your brought and for the smiles and memories you created. RIP Johnny Barnes. A legacy of memories never to be forgotten. Condolences to family and friends. A huge loss, RIP great man. What about leaving it just the way it is, Crow Lane! We all call it Johnny Barnes roundabout anyway. Just need to make it official! I think an Official rename to Johnny Barnes Roundabout is in order. And move the statue. Absolutely – we need that statue on Johnny Barnes Roundabout! No imposters allowed! We should all stand at the side of the road and wave at his casket and tell him we love him on his final journey to his grave. RIP Johnny Barnes. Jesus Take The Wheel………it’s official, these people have lost their minds. Thank you for making the morning a bit brighter all these years. You will always be remembered. RIP Mr Barnes, I can remember specifically the day he decided to wave to the morning traffic. I’m pretty sure he got the inspiration from a gentleman that was doing the same thing in a small town in the United States. I remember watching him on the news one evening then seeing Mr Barnes the very next day doing the same thing. Regardless, he will be sadly missed! Someone will crash into it every few weeks. I hope something quite special along the lines of a state funeral will be organised with the island coming out in force to say their goodbyes. Oh really, you dont know a damn thing about me or my life and evidently you dont know anything about JB either, but many of us do, thats why there are dislikes on these posts. and BTW I live in a free society where I can voice my opinion freely as you just did, so the next time you want to call an individual disgusting check your facts first before you open your mouth. @Herb, it’s not a pretty/bright history from what I understand from a few. @ Hurricane indeed it is not, amazes me that folks can make a “hero” out of someone so easily without knowing the background of the person. Mr. Barnes epitomized what is means to be Bermudian. He was a living example of a dying tradition of hospitality and good ole fashioned manners. I am certainly going to miss your smile and your welcome. Thank you for your years of sacrifice and service to the people of Bermuda. I hope we honor you in a manner fitting of your years of sacrifice. Mr. Johnny Barnes. One of the very few people that everyone knew and no one could say a bad word about. Even when his self imposed shift ended that day, he would still walk about town with his bible in hand and talk to folks. He lived his faith. Now he lives with the Father of his faith. I think all Bermudians can say a collective AMEN, We love you Johnny. What, Alabama? He may have tried, but he was no JOHNNY! Irreplaceable Johnny. RIP dear Johnny! Johnny waved and blew kisses at me when I visited beautiful Bermuda in 2011. He would soften the stoniest of hearts. May he rest in peace and be always with us. I think it’s so sad to see just 30 comments, Wow!! I guy that use to wake up early to be at crowlane to greet the people of Bermuda, A lot of people never appreciate what he use to do. It’s sad that you don’t see more love for him on here, Rest in peace Mr.Barnes you will never be forgotten. I will miss seeing you on my way to work, and also I miss you when I use to pass you driving the bus……S.I.P Dear friend, heaven has another angel. Tears are streaming down my cheeks as I read this news, as well as people’s Loving Comments. Johnny Barnes spread Real Love. It’s wonderful that Desmond Fountain made his open-armed statue of Johnny, so that people will regularly be reminded of him and filled with his message of spreading God’s love to Everyone. (Should Crow Lane’s name be changed in order to honour Johnny’s giving so much love to all, from his Heart, I “second the nomination” suggested above by the Commenter going by the name of “We love you Johnny”, only with a minor editorial addition IN ORDER TO CONTINUE TO REMIND EVERYONE OF JOHNNY’S LOVING MESSAGE: “Johnny Barnes’ Way” ~ with the slight addition of an apostrophe, the name serves a dual purpose: instead of simply being the use of the word “Way” instead of “Roundabout” or “Lane”, it would speak literally of HIS “WAY”: OF HIS OPEN-ARMED AND OPEN-HEARTED DAILY MESSAGE TO EVERY SINGLE HUMAN: “I love you!”) RIP, glorious Heart; you not only won the game of Life, you immeasurably helped and encouraged innumerable others to “Have a Heart”, to “Love One Another”, and to carry on, no matter what burdens they were carrying! GodSpeed, and infinite Love, remarkable Hero! Your message WILL continue-on to inspire and to encourage! Job well done Sir. Rest in peace, we’ ll take it from here. I nominate mr. Johnny Barnes as our national hero for 2017. All those in favor let it be known. May the open arms of heaven receive Johnny Barnes, the way his own open arms spread the love and goodwill of Bermuda, amongst those traveling into the town of Hamilton. His body is gone but his spirit must never be forgotten, as it is a shinning beacon so desperately needed in todays troubled world. A true Spirit of Bermuda. For me the “Crow Lane roundabout “will ALWAYS be the”Johnny Barne’s roundabout” Much nicer name and way to remember Johnny. Thank you for your smiles and love Johnny!! Rest in peace. Bermuda will miss you! God bless you my friend he gonna miss you!!! For 20 years I enjoyed his smile and wave in the mornings. In recent times as he aged I always tried to roll down my window and reply “Good morning, Mr. Barnes” (while driving and navigating the roundabout) as the day I feared would come. When Johnny left his post I missed him but wished him well. Now he is gone from the island but in a happier place. Thank you for your love, Mr. Barnes! God bless my friend R.I.P!! Now Johnny truly is a National Hero! Everybody loved Johnny, he epitomized how we should love and treat each other. No one could ever judge him as being anything but a positive fixture on that roundabout every morning. He put a smile on everyone’s face. You will be so missed Johhny. Mr. Johnny Barnes a legend in his own right, a man who many have had the privilege to know as a icon, and many have been blessed by his constant witness of Jesus Christ. I look toward Heaven and just think that God don’t miss a beat, just in a period of a week and a half, The Hon: Anne Cartwright Decouto, Lady Jacqueline Swan and The legendary Mr. Johnny Barnes. Three Icon’s who gave unselfishly to this country in many ways, whose lives have touched countless of people both local and foreign, so in all seriousness I feel as Royalty has passed from our midst and these are great shoes that have been left on the path, for many to fill. These are our Elder Statesman that have paved the way, just a few short weeks before, Dr. George Thomas, I know some may say this is all about Mr. Johnny Barnes, but I beg to differ because the daddy Barnes I knew, would say this is about all of us together as one. You have been called many things of great notoriety, but as I often heard you quote down the years, it is not what they call you, it is what you answer to, and you will close it by saying, all I look forward to being called is not even my name, but to hear my Savior say, Thou good and faithful servant enter ye into the house of the Lord. Blessing’s upon you Mother Barnes and the entire family, along with The Seventh Day Adventist Churches throughout Bermuda where he was a member, and to the entire Bermuda community to who Mr. Barnes revered as his own family. Mr. Johnny Barnes was a friend and a great role model. He set an example for everyone to follow . A kind word , “I Love You , ” will brighten anyone’s day. Our prayers are with your family and friends. Johnny Barnes round bout… come on. . It’s not a mind stretch. ..
@Herb! Why are you such a HATER!!! That comment is definitely inappropriate and uncalled for during a time such as this! Some people can be so WICKED and EVIL for no reason at all! That comment was TOXIC! Its true !! Some people will never EVER have anything good to say even after death! My Father always tells me that there is a lesson in everything! My lesson is to live my life to the fullest regardless of what people may say or think of you! They talked about Jesus so what chance do I have! Sad but true! As you can see from that HATER Herb! Hallowed by thy name. Forever. Sleep in peace Uncle Johnny! Heartfelt condolences to Aunt Belvina and family. Many many heartwarming comments have been made on this blog and a few cold callous comments also. No one is perfect and we have all made mistakes in life. People change, they seek God and ask for forgiveness and do their best to share Gods love for that. For those would dig up Uncle Johnny’s past, stop and take a look in the mirror and ask yourself if your life is flawless, which i’m sure is not. Even we as Christians have flaws. For those who would dig up the past, i sure hope and pray that when your eyes close for the last time on earth, that someone would be able to say just one kind thing about you and not dig into your past and pull out your skeletons. One final word, don’t be too quick to judge people, your day of judgement is coming soon too. I pray that God will hace mercy on the dirt diggers.